For those who doubt that Herman Cain poses a real threat to upsetting the GOP presidential race’s apple cart…..and has instilled a certain level of fear in the Left (as well as some quarters on the Right)…..proof-positive was delivered to doorsteps today in the form of a New York Times story trashing the guy and his campaign in typical NYT bush-league style. * Bumper stickers have reportedly been hard to come by….a clear indication that the man has no idea whatsoever how to create jobs and rescue the economy. Good grief. * There was an email to staffers traveling with the candidate instructing them not to speak to the candidate unless the candidate speaks to them first. May sound harsh and petty, but a candidate has a lot on his mind and everyone and their uncle wants to chat with him. When away from the crowds, a candidate needs some time to be alone with his or her thoughts…uninterrupted. That’s just the way it is. * A former staff member who quit the campaign cited the email as one of his reasons for leaving. The former staffer was granted immunity….er, I mean anonymity, in order to trash Cain without fear of repercussions should his claims be, you know, not true and stuff. * Cain’s veteran chief-of-staff, Mark Block, did a campaign video that went viral yesterday in which he is seen taking a drag off a cigarette at the end – which apparently is just a little less offensive than if he’d been taking a drag off a crack pipe or sticking a hypodermic needle in his arm. While the video is certainly unconventional, it’s also what everyone was talking about yesterday. Yet somehow that’s a “bad” thing? * The NYT, referring to even more interviews with “anonymous” former Cain staffers/volunteers, says Cain “appears to show ambivalence toward basic campaign management” – as if it’s the candidate’s job to manage the basic campaign operation. It’s not. That’s why you hire managers; to manage. Duh. * Another criticism: “Several former workers interviewed for this article said they were directed by the campaign not to speak with reporters.” Um, double-duh. I don’t know of a single professional campaign that doesn’t dictate that only those authorized to speak with reporters are to speak with reporters….and in some cases the only person with such authorization is the candidate himself. * Two anonymous former campaign workers say they were required to sign a non-disclosure agreement as a condition of employment; standard fare in the private sector real world. Of course, these two former staffers broke their word and talked to the NYT anyway. And we’re supposed to trust that what they say is true? * “Some former aides” – again anonymously – whined that Cain “did not spend much time with workers” during the summer months, and didn’t “plan conference calls or staff meetings.” Waaaahh!! Sounds like Cain should have used that bumper sticker money to buy pacifiers. Hello? It’s a presidential campaign that was considered second-tier and comparatively underfunded until just a couple weeks ago. Of COURSE it was flying by the seat of its pants! That’s the way real life works; an obstruction is thrown in your path and you quickly take corrective action. Duh. * Another anonymous former aide complained about Cain doing a nationwide book tour this fall instead of campaign the way everyone else does, focusing almost entirely on Iowa and New Hampshire. But this is the stupidest criticism I’ve heard yet. The book was commissioned months ago, long before anyone had any reasonable expectation that Cain would rise to the top tier of candidates. And the book has provided Cain the kind of national exposure that helps attract new donors so the campaign has the money to compete that it wouldn’t otherwise have. It was a calculated, high-risk gamble – on both the author’s and publisher’s part – that may end up being campaign genius. * Staffers of the underfunded campaign gripe about not having a campaign office or phone. “We couldn’t even get our own e-mail addresses,” whined one of the few critics with the cojones to go on record using his real name. These folks obviously have no experience in what is known as a “guerilla” operation in the private sector real world of start-up businesses….which, by the way, is EXACTLY what this presidential campaign is. And on and on and on like this. All I can say is that if anonymous carping and kvetching by underlings who all think they know better than the boss is a serious reason not to support Cain, then it’s no wonder we end up with empty suits like Barack Obama in charge. 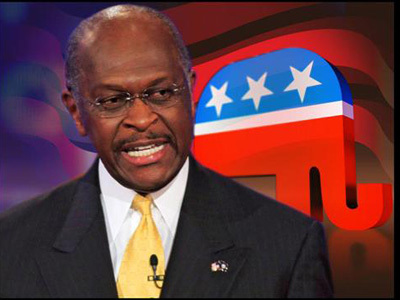 Cain is a business executive, not a politician (though he has run for office, U.S. Senate, once before). As such, some are saying he’s not experienced enough in government to know how to run the government. It’s the same knock we heard against Ross Perot. It’s the same knock we heard against Steve Forbes. As such, we elected experienced politicians instead of those experienced business leaders. So let me steal one of Herman’s best lines and ask this question: How’d that work out for us? P.S. Mitt Romney was supposed to participate in a conference call with a national group of conservative activists today, but something unexpected came up and Romney had to cancel. Guess that means his campaign is disorganized and flying by the seat of its pants and he’s not qualified to be president either, right?